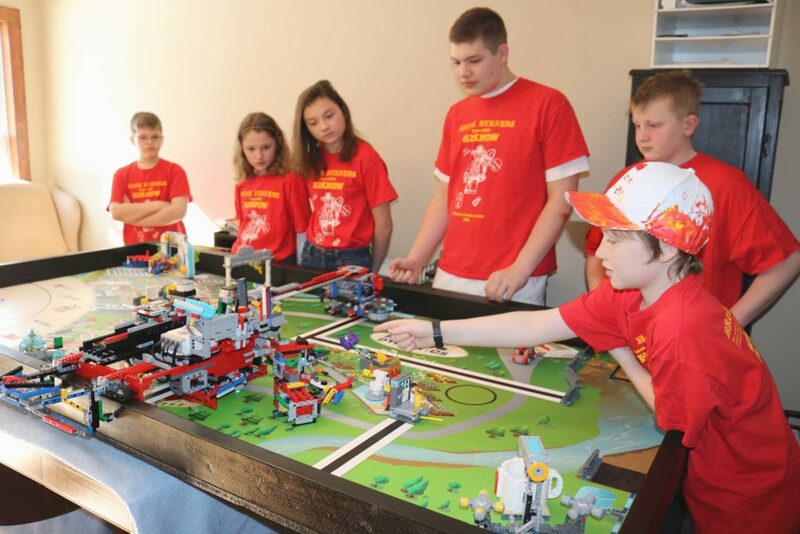 Local Lego League team the Brick Burners are set to compete at an international level in May. They will bring their hydro dynamics lego-robot, shown here, with them to Carlsbad, Calif. for the FIRST Lego League California International Open from May 18-20. Teamwork. Critical thinking. Hundreds of hours of work. That’s what a group of nine local students have put into their Lego League project this year, and they’re headed to an international competition after placing second overall at the state level. “Every year, there’s a subject and we have to come up with a theoretical solution,” said six-year Lego League veteran and ninth-grade student Reece Tyrrell. He is one of the Brick Burners, which is associated with the Central Iowa Christian Home Educators. The team will be going to the FIRST Lego League California Open competition at Legoland in Carlsbad, Calif., from May 18-20. “They created a theoretical solution, and that’s what they’re going to present,” said team coach Grant Jacobson of one part of the competition. The team will present their water treatment solution device, which they dubbed the ‘H2-No,’ in a skit involving tainted water. The device is made from Lego bricks, but a lot of research and expert advice went into the concept. Additionally, the students put together a complex hydrodynamics table project, which combines the brightly-colored plastic bricks with robotics. The robot moves around a specialized table, which is given to each team, and demonstrates concepts of how water can be used, moved and disposed. Another core part of the Lego League competition is using teamwork and leadership to solve problems. The Brick Burners not only enjoy what they do together, but many grew up watching older siblings compete as well. “Both of my brothers have been in it, and that kind of made me want to be in it,” said fifth-grader Luke Jacobson, adding is favorite parts of the challenge are the robot and the skit. Seventh grade student Quinn Weidenaar also said she was inspired to join by older siblings. Other members of the Brick Burners include Reece Jacobson, Zoe Weidenaar, Stephen Blom, William Tyrrell, Grace Rasmussen and Caleb Rasmussen. Grant Jacobson said the team is still seeking business and community sponsorship to help finance the trip to the competition. They will be doing a tip night fundraiser at the Dairy Queen at 2107 S. Center St. the evening of Tuesday, Feb. 20.